The history of St Petersburg on the Neva banks begins approximately from the VIII century, when around 750 years in the lower Volkhov river was founded the settlement of Ladoga (now Staraya Ladoga). Quite quickly, it became a major, if not the largest, trade point in this region, since it was on the most important trade routes: Baltic-Volga and Baltic-Black Sea. They along the Volga and the Dnieper led to the Arab Caliphate and Byzantium. It was in Ladoga, according to the chronicle, the first Russian princes Rurik and Oleg. In 1617, in accordance with the Stolbov Treaty, which put an end to the war unleashed by the Swedes during the interregnum in Russia, the so-called “Time of Troubles”, the Neva banks lands and access to the Baltic were secured for Sweden. 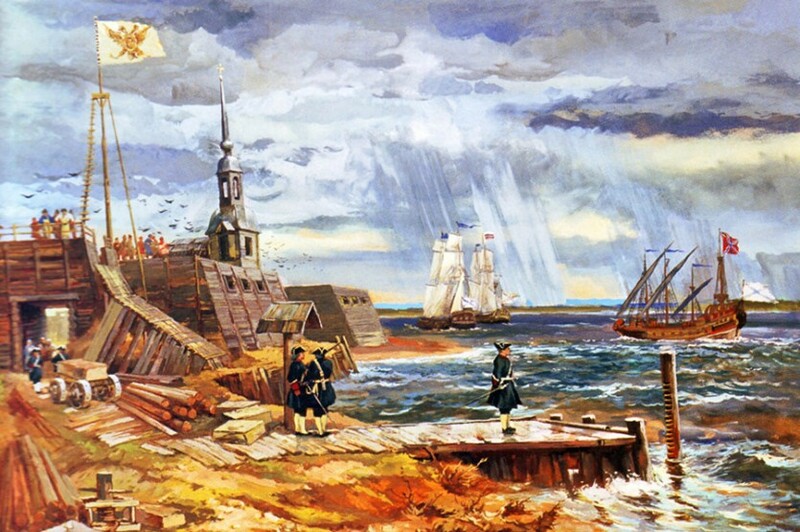 At the end of the 17th century, with the exception of the Arkhangelsk Port, Russia had no access to the European seas. Without this, the country could not successfully trade and develop economically. The Black Sea and the Sea of Azov were in the hands of the Turks, the Baltic coast belonged to Sweden, and, consequently, the resolution of the problem of maritime boundaries could only occur through war with Russia’s well-armed and strong neighbors. Peter I believed that Russia needs access to the sea, and this influenced the direction of Russia’s foreign policy at the turn of the 17th and 18th cent. In 1703 the fortress named Saint Petersburg was found in order to defense the newly conquered lands in the course of war with Swedes. And what is St Petersburg? St Petersburg became the whole city developed around the fortress in 18th century, named after the saint patron of Peter the Great apostle Peter. After the end of the Northern War in 1721, Peter I assumed the title of emperor and the lengthy process of the formation of the Russian Empire was formally completed. Petersburg became the largest center of foreign trade of Russia. By the end of the Petrine era, half of the volume of Russian exports to Western Europe was exported from here. According to the will of Peter I, St. Petersburg was to become a European city. Since the time of Peter I, European experts – architects, sculptors, artists – have been invited to Russia. Despite the fact that the place chosen for the city was in the north – St. Petersburg lies on the same latitude as Greenland, Alaska and Chukotka – Peter I developed a grandiose construction here. At the time of the development of the city, swampy, impassable swamps occupied large areas. In Peterburg, such a large amount of work was carried out to soil the soils, to strengthen the river banks and drain the building, which the world town-planning practice of that and our time did not know. The forest was brought from the shores of Ladoga Lake and from Novgorod. In order to have a stone for building, Peter introduced a special tax: every resident of the country who came to Petersburg with goods or groceries had to bring with him a certain number of stones. Peter I also imposed a ban on the construction of stone houses first in Moscow, and then in the whole empire. As a result, unemployed bricklayers from all over the country flocked to St. Petersburg. Soon drainage canals were dug, piles were blocked, streets, houses, churches, hospitals and government agencies appeared. Petersburg has been regarded as the capital since 1712, when the Tsar’s court moved from Moscow to the banks of the Neva. Moscow became again the capital in 1918. Saint Petersburg, Petrograd and Leningrad are all names of the same city. The First World War greatly influenced the fate of St. Petersburg. In August 1914, in the wake of anti-German sentiment historical German-like name by the decree of Nicholas II, was changed onto Petrograd which is translated as the city of Peter. In 1924 already Soviet Petrograd became Leningrad after the death of Bolsheviks leader V. Lenin. Leningrad name change occurred in 1991 just before the Soviet Union collapse with accordance of citizens vote poll and the city again received the name St Petersburg. Petersburg is the cradle of three Russian revolutions. The Russian Revolution of 1905 or the First Russian Revolution was the name of events that occurred between January 1905 and June 1907. The impetus for the start of mass demonstrations under political slogans was the “Bloody Sleeplessness” – the execution by the imperial troops in St. Petersburg of a peaceful demonstration of workers led by the priest Georgy Gapon on January 9 (22), 1905. The outcome of the speeches was the Manifesto of October 17, 1905, which granted civil liberties on the basis of inviolability of the person, freedom of conscience, speech, meetings and unions. There was the Parliament was established, consisting of the State Council and the State Duma. The February 1917 bourgeois democratic revolution was a massive anti-government campaign by the Petrograd workers and soldiers of the Petrograd garrison, which led to the overthrow of the Russian autocracy and the creation of a Provisional Government that concentrated all legislative and executive power in Russia in its hands. The revolutionary events covered the period of late February-early March 1917 (according to the Julian calendar that was in effect at that time in Russia). The immediate result of the February revolution was the abdication of the throne of Nicholas II on March 2 (15), 1917, the termination of the Romanov dynasty and the formation of the Provisional Government under the chairmanship of Prince George Lvov. The October Revolution (the full official name in the USSR is the Great October Socialist Revolution). The Provisional Government was overthrown during the armed uprising on October 25-26 (November 7-8 according to a new style), the main organizers of which were V. I. Lenin, L. D. Trotsky, I. M. Sverdlov and others. Tragic pages of the history of the city are associated with the outbreak of World War II. For several years, Leningrad was in the ring of blockade of the fascist invaders. People stayed in the city without food, heat, electricity and running water. September 8, 1941 Leningrad was taken into the blockade ring. It was breached on January 18, 1943. By the beginning of the siege in Leningrad, there was not enough food and fuel reserves. The only way to communicate with the city was Lake Ladoga. It was through Ladoga that the Road of Life lay – the highway, along which cargoes with food were delivered to blockade Leningrad. Over the time of the blockade, over 630,000 Leningrad residents died of starvation and deprivation. This figure was announced at the Nuremberg Trials. According to other statistics, the figure can reach 1.5 million people. Only 3% of deaths occur in fascist shelling and bombing, the remaining 97% were killed by famine. On January 7, 1944, 872 days after the blockade began, Leningrad was completely liberated from the Nazis. St. Petersburg is located at the eastern tip of the Gulf of Finland of The Baltic Sea. The area (with administratively subordinated territories) is 1439 km ².
St Petersburg population is 5,225.7 thousand people (as of January 1, 2016 according to Petrostat’s data). St. Petersburg – the second (after Moscow) in size the city of the Russian Federation and the third (after Moscow and London) – in Europe. St. Petersburg is a cultural center of world significance, with 6807 objects of cultural heritage (historical and cultural monuments), including 1125 objects of cultural heritage of federal significance, which is almost 10% of all monuments protected by the state on the territory of the Russian Federation. St. Petersburg is one of the largest scientific and educational centers in Russia, where more than 10% of the country’s scientific potential is concentrated, comprising more than 300 scientific organizations, including more than 65 organizations of the Russian Academy of Sciences and other state academies, 10 state scientific centers, more than 170 educational organizations of higher and secondary vocational education. St. Petersburg is characterized by a ramified transport system, an important role in which bridge structures play. This is primarily due to the specific geographical landscape – in the city is full of rivers, hoses, ducts and channels with a total length of 300 km. The basis of industry in St. Petersburg is more than 740 large and medium-sized enterprises, some of which are among the leading enterprises ща Russia. The shipbuilding industry of St. Petersburg is one of the most socially important branches of the economy, which is an indicator of the scientific and technological development of the city. The shipbuilding potential located on the territory of St. Petersburg is unique. The cluster structure includes 43 enterprises and organizations. In St. Petersburg, up to 80% of the capacity of scientific and design potential of the industry, up to 30% of the volume of production in the shipbuilding sector throughout the country. Cultural and recreational facilities – 53 and many others. The climate of St. Petersburg is moderate, transitional from moderately continental to moderately-marine. Due to the small amount of solar heat, moisture evaporates slowly. 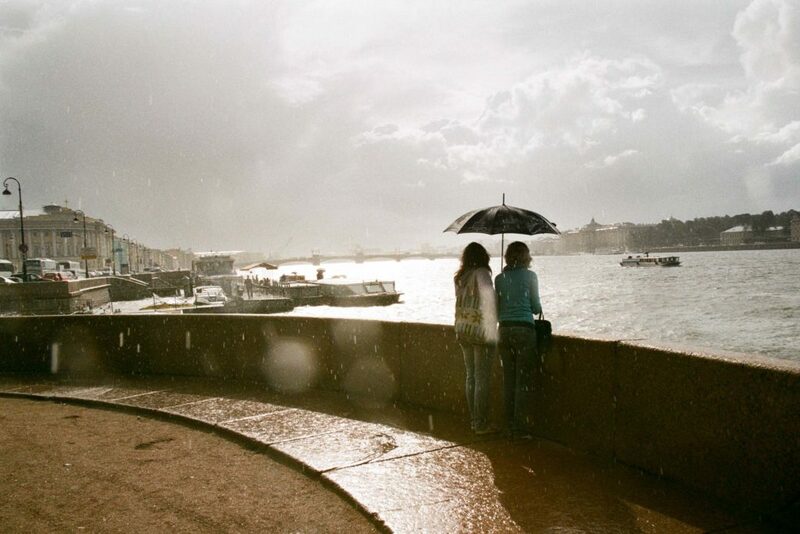 For a year in St. Petersburg there are an average of 75 sunny days. Therefore, during most of the year, days with cloudy, cloudy weather, scattered lighting prevail. The duration of the day in St. Petersburg varies from 5 hours 51 minutes in the winter solstice to 18 hours 50 minutes in the summer solstice. In the city there are the so-called “white nights“, which occur on May 25-26, when the sun falls no more than 9 ° beyond the horizon, and the evening twilight almost merges with the morning. The white nights end on July 16-17. In total, the duration of the white nights is more than 50 days. The coldest month in the city is February with an average temperature of -5.8 ° C, in January -5.5 ° C. The warmest month is July, its average daily temperature is +18.8 ° C. The humidity in St. Petersburg is always high. The annual average is about 75%, in the summer – 60-70%, and in the winter – 83-88%. Most of the precipitation falls from April to October, with a maximum in August and a minimum in March. During the year, the average number of days with precipitation is about 200 (from 13 days in April to 22 days in December). Petersburg weather is very changeable and difficult to predict. Therefore, most people on the streets, regardless of the season, are holding an umbrellas. It also sometimes raises a strong wind, and even in summer, if, of course, it isn’t 30 degree heat, it is better to take a windbreaker or sweater with you for a walk.